The Johnsons are becoming country music stars. They're on TV and the radio--and it's all because of James. His voice and his guitar playing bring the songs to life, and make the audiences beg for more. Most kids would love it. Not James. 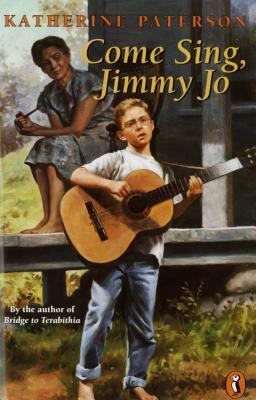 He's had to change his name to "Jimmy Jo," dress in clothes he hates, and turn into someone else. Will he ever be able to cope with the fame? Katherine Paterson is the renowned author of many classic children’s books, including Bridge to Terabithia; The Great Gilly Hopkins; Lyddie; Jacob Have I Loved; Come Sing, Jimmy Jo; and The Master Puppeteer, among many others. Her work has won two Newbery Medals and a Newbery Honor, two National Book Awards, and the Astrid Lindgren Memorial Award. She also served a term as the National Ambassador for Children’s Literature. Katherine lives in Vermont. Visit her website at www.terabithia.com. * "Paterson's talent for storytelling truly shines in this book . . . . It is a gift to its audience, a special gift that should not be passed by."